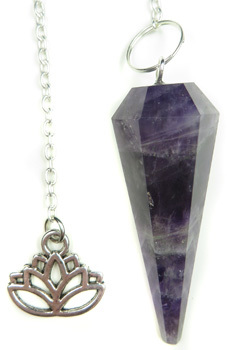 A faceted Amethyst pendulum adored with a lotus charm. Comes with a velveteen pouch. The lotus is the foremost symbol of beauty, prosperity and fertility. According to Hinduism, within each human is the spirit of the sacred lotus. It represents eternity, purity, divinity, and is widely used as a symbol of life, fertility, ever-renewing youth.